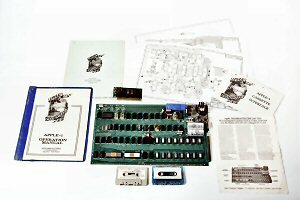 I saw in the news a couple of days ago that another Apple-1 microcomputer was sold at auction last week for $815,000. This was less than the record amount of $905,000 paid for an Apple-1 in October 2014 but is still an impressive figure given the downward trend in prices fetched for these rare early microcomputers (as reported in my previous posts on this subject). The likely reason for the high price paid is that this particular example would appear to be one of a very small number of pre-production prototypes in which the electronic components were soldered onto the motherboard by hand (rather than using a wave soldering machine, as was done with the production units). This also suggests that it was not originally sold through the Byte Shop or by mail order but was probably one of the units sold directly by Jobs and Wozniak to their fellow Homebrew Computer Club members. Unusually, this story has an altruistic aspect, as the Apple-1 prototype was sold by online charity auction site Charitybuzz, with 10% of the proceeds from the sale going to The Leukemia & Lymphoma Society of Arizona. The buyers, Glenn and Shannon Dellimore, are also planning to take the machine into schools and universities to “help inspire young people“, although this might prove quite challenging, having purchased a non-working example of an Apple-1. This reminded me of a project I was involved in a few years ago to create a virtual working replica of Charles Babbage’s Analytical Engine. The idea was to prove that Babbage’s unrealised design for the Analytical Engine was indeed complete and would have functioned according to plan, and to use the resulting fully functional 3D computer model of the Engine as a teaching aid for students of computing. Unfortunately, we were unable to secure funding for the project and it never went ahead but good ideas have a habit of resurfacing and there is now a similar project underway called Plan 28 which involves Babbage expert Doron Swade amongst others. This entry was posted in Computers as Collectibles and tagged Apple I, Charles Babbage on 31/08/2016 by Stephen J Marshall.